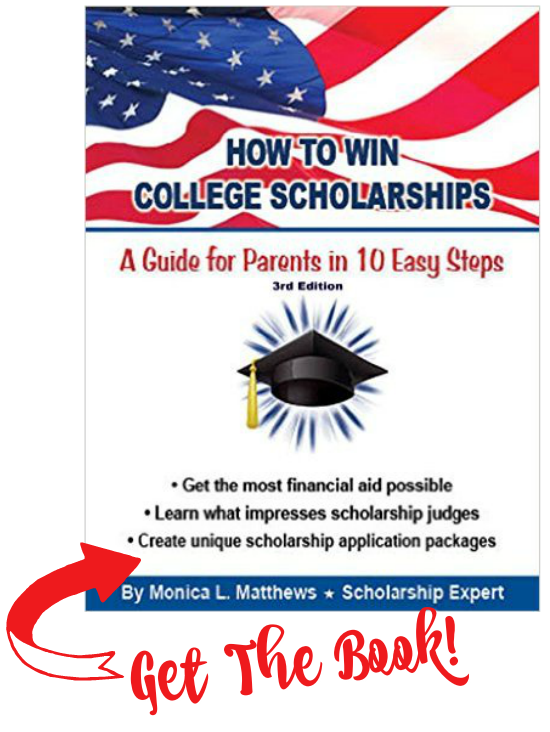 Monica Matthews is the author of “How to Win College Scholarships.” She helped her own son win over $100,000 in college scholarships and now shares her expertise with other parents and their students. She truly has “been there, done that" in regards to helping parents and students navigate the scholarship process. Her methods of helping students in finding college scholarships, writing unique and compelling scholarship essays, creating amazing scholarship application packets and more, have taught overwhelmed parents to help their own students win thousands of scholarship dollars. Her scholarship tips can be found on several websites and online publications. Ms. Matthews has been dubbed the "Go To" expert on college scholarships and her scholarship guide, blog, and tips can be found at https://how2winscholarships.com. Monica Matthews can also be found on Twitter, LinkedIn, Facebook, Pinterest, SmartCollegeVisit, RealityMoms.Rocks, TUN - The University Network, YouTube, Oroola, FIRST Robotics - FIRST Inspires, College Week Live and Huffington Post. As the College Scholarship Expert and "Scholarship Mom" for SmartCollegeVisit.com, my weekly scholarship tips are published and promoted as a way to help families in the college scholarship process. 5th year teaching program with Reading Specialist focus. Hi Monica - I could not get the Quick text buttohn to work and not sure how to respond to your message- so I came Here! Can we please talk at 5pm on Monday the 15th instead of 10 a.m. I would like for Jonah to be on the call with us and I also have an installation at 10 that day. Hi Deb, I can do 5pm on the 15th, but 4:30 would be better. Any chance you and your son can do 4:30 est? Hello Mr. Hung, this article will help you and your student with international scholarships. I'm curious... of the $100,000 you helped your son earn, how much of it was he able to accept and actually use towards college expenses? Hello, I'm a little confused by your question. He used all of it to pay for his college expenses. My child applied and has been accepted to every school she applied to. She also applied to several merit based scholarships and has not been a selected recipient. We were hoping scholarships will help us refine her selection. How do we help her narrow down her choice ? Hi Therese, has she gotten financial aid offers from the colleges? You need to compare these offers and see what your family can afford. In the meantime, there are lots of scholarships with deadlines that have not yet passed, so encourage your daughter to apply for as many as she possibly can. Do unique experiences weigh into the college scholarship decision process? For example, study abroad programs or volunteer experiences - do they matter much? Hi Brian, unique experiences absolutely make a difference in the scholarship decision process! Each scholarship is unique, however, and students need to use each experience to align as closely as possible to each one. For example, a student who has many years of quality volunteering (with the same organization) should concentrate on scholarships that focus on community service. They should then share in detail about their volunteer experiences (in an interesting and detailed story-form) in their essays. When choosing a letter of recommendation writer, the student can then ask a leader in that organization to write a letter with examples and personal details about how that student has made a difference in his or her own community. In my scholarship guide, How to Win College Scholarships, I show students and their parents exactly how to impress scholarship judges by highlighting personal experience and leadership skills, which are both highly valued by college scholarship judges. I hope that helps answer your question. Feel free to contact me again anytime. How does one address and balance both strengths and weaknesses in an essay? Hi John, that's a great question. In the scholarship essay, students need to align themselves as closely as possible to what they think the judges are looking for in their winner. They can find this out by reading the mission statement of the company or organization offering the scholarship and reading the essays of previous winners, if shared online. Judges love to hear true, detailed stories of how students have overcome obstacles in their lives, so sharing a weakness and then writing about how that weakness was overcome is one way to share both strengths and weaknesses in an essay. There is no rule that weakness has to be shared however, so students needs to decide if they even want to let the judges see what they struggled with in the past, or even currently. If the essay question directly asks students to write about both weakness and strength, students need to make sure they start off their essay with a hook (an eye-catching first few words that draw the reader in), write from their hearts, and end with a positive, uplifting tone. I share a lot more about writing a memorable and effective scholarship essay in my ebook, How to Win College Scholarships, so I encourage you to request a call with me to get your copy and learn my unique scholarship strategies that have helped so many parents and their students win college scholarships. You can also find more scholarship information and tips on my website at how2winscholarships.com. When is the best time to start applying for scholarships? It really depends on the age and level in school of you or your student, but there is never a wrong time to begin the scholarship process and apply for scholarships. Most people assume scholarships are for high school seniors only, but there are plenty of scholarships available for all levels of students, from elementary to grad school. My best advice is to start where you are right now. Younger students can benefit from what I call "Scholarship Prep", which is volunteering with their families, getting good grades in school, and having a special place in their home for all honors and award certificates. There is no "scholarship season" and many make the mistake of waiting until the spring of their senior year in high school to begin applying for scholarships. Start now, right where you are. Find out the scholarship applying process I developed in my ebook, How to Win College Scholarships by requesting a call with me. You get a free copy of my scholarship guide with each paid call. You can also visit my website at how2winscholarships.com for additional scholarship help.